Studio Line: Universal Studios - Prepare for the end. 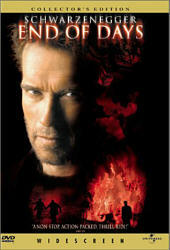 All hell breaks loose when Arnold Achwarzenegger battles the ultimate evil in this chilling supernatural action thriller. When a burned-out former New York City cop named Jericho (Schwarzenegger) is assigned to security detail for a mysterious and foreboding stranger (Gabriel Byrne), Jericho thwarts an incredible assassination attempt. During the ensuing investigation, he and his partner (Kevin Pollak) save the life of the beautiful and terrified Christine York (Robin Tunney), whose destiny involves death, the devil and the fate of mankind. Now it's up to Jericho to save the girl, the world and his own soul as he comes face to face with his most powerful enemy ever! Box Office: Budget: $83 million. Opening Weekend: $20.523 million (2593 screens). Domestic Gross: $66.862 million. DVD: Widescreen 2.35:1/16x9; audio English DD 5.1, French Dolby Surround; subtitles none; closed-captioned; single sided - dual layered; 20 chapters; rated R; 123 min. ; $26.98; street date 4/18/00. Supplements: Spotlight on Location; Feature Commentary with Director Peter Hyams; Special Effects: "The Devil's Playground"; Soundtrack Presentation Featuring: Never-before-seen Everlast music video and Rob Zombie's rarely seen music video; Book of Revelation; Theatrical Trailer; Universal Showcase; Special DVD-ROM Features. That whole millennium thing sure was a bust, huh? And not just for the folks who wasted money on canned goods and bottled water or for the Satanists who wanted the downfall of society. Financially, a lot of people took a bath, especially everyone who created these mega-expensive New Year's Eve parties that attracted few revelers. Hollywood also suffered from the lack of millennial fever, mainly because they foisted a bunch of apocalyptic efforts upon us but none caught fire at the box office. Probably the most highly-anticipated of the bunch was End Of Days, which also had the distinction of being the last millennium-oriented Hollywood film to appear prior to the actual date. Add to that its $83 million budget and the fact it was Arnold Schwarzenegger's first movie since 1997's Batman and Robin and you can understand why so many viewed it as a potential blockbuster. Alas, that was not to be. I don't know if EOD was a victim of millennial apathy or if movie-goers just thought it looked stupid, but it didn't perform at the box office. It grossed a not-horrible but pretty weak $66 million in the US and faded away pretty quickly. And pretty deservedly so. EOD isn't a terrible movie but it's a pretty blah one, and that's not a good sign for an action/horror/thriller. The film's greatest flaw stems from the fact that for pretty much all of the movie, we're way ahead of the characters. It's not unusual for films - particularly horror pictures - to let the audience in on aspects of the action before the on-screen participants learn, but in this case, it reaches an absurd extreme. By maybe ten minutes into the thing, we know exactly what's happening - and what will happen - for at least the first half of the film. That means an hour or more of plot that goes nowhere because it's already essentially been covered. The second half of EOD isn't quite as predictable, but by that point, the film had already lost me, and the events of the final hour weren't compelling enough to regain my interest. Sure, the movie contains a few well-executed action pieces - actually, one chase scene early in the picture provides some of its best thrills - but these can't redeem the film's slow pace. EOD offers Arnold Schwarzenegger's first movie since 1997's disastrous Batman and Robin, and it's clear he hasn't spent the time off taking acting lessons. To be fair, Arnie is and always will be more of a solid presence than an actual thespian, and even though he's slimmed down after his heart surgery, he's still bulkier and more chiseled than 99 percent of us could ever hope to be. He actually looks more recognizably human, which helps him in this role, one that requires him to be more sensitive and less robotic than usual. Unfortunately, he still can't quite pull off the emotional aspects of the movie, though I applaud him for trying. Also underwhelming is performance by Robin Tunney as Christine, the woman at the center of the plot. Arnie can't act, but at least he offers that strong presence; Tunney, on the other hand, might have some acting skills but provides an absolutely negligible presence on-screen. She's so wan and flat that she might as well not have been there. Couldn't they find someone with a little more zest and personality? At least two of the supporting actors help. We get the wonderful Gabriel Byrne as "The Man" (really the Devil). He has some trouble with his American accent but otherwise gives the film a really kick in the pants with his slyly subversive portrayal of the ultimate baddie. He contains any thoughts of over-emoting and provides EOD with some of its high points. I'm not much of a fan of Kevin Pollak but he does at least give his formulaic role as Arnie's sidekick Chicago a bit more punch than the usual comic pal. By the way, it should be observed that EOD displays a something of a Usual Suspects-wannabe syndrome. Not only are two of that film's stars in EOD (Byrne and Pollak) but it also steals one of Usual Suspect's most memorable lines, "The greatest trick the devil ever pulled was convincing the world he didn't exist." This was some pretty shameless stealing, but at least it made End Of Days more interesting to me since I could think about the vastly-superior Usual Suspects for a while and be entertained by those memories. EOD is a slickly-made, mildly watchable thriller that doesn't do much terribly wrong but simply never catches fire. It offers a few thrills but they're too few to make the movie anything good. End of Days appears in its original theatrical aspect ratio of approximately 2.35:1 on this single-sided, dual-layered DVD; the image has been enhanced for 16X9 televisions. As one might expect of such a recent - and expensive - movie, End of Days provides a pretty solid picture. Sharpness is one of this DVD's strongest points, as the image looks consistently extremely crisp and detailed; even in wide shots I never noticed the slightest softness. Moir� effects and jagged edges also appeared absent, though I did see some mild artifacts from the anamorphic downconversion on my 4X3 TV. The print used for the transfer seemed largely very clean, with no signs of grain, speckles or scratches. Strangely, I did observe what appeared to be two burn-holes about a half an hour in to the movie, which offered a weird anomaly in an otherwise clean print. As is typically of such apocalyptic films, the palette of EOD is pretty restricted, but it manages to seem accurate and clear. We do find some rich reds at times, which liven up the picture. Black levels are always deep and dark, and while shadow detail occasionally seemed too heavy - especially early in the film - it usually appeared appropriately opaque but not overly so. All in all, End Of Days looks very good. Even better is the movie's bombastic Dolby Digital 5.1 soundtrack. This mix provides a very nicely encompassing experience. The soundfield created sounds excellent, with all five channels actively blasting mayhem at you. It also serves quieter moments well, as we hear subtle effects pop up all around us. From start to finish, this mix cranks up the action and really helps make an otherwise somewhat blah movie more exciting. Audio quality also seems very good. Dialogue occasionally gets a little buried in all of the noise, but it appears clear and natural, without any overtly "dubbed"-sounding instances. The score seems a bit overwrought but it sounds good, with appropriately bright highs and some solid bass. Effects also appear clean and realistic, and they pack a strong punch. End Of Days sounds great. End Of Days is part of Universal's generally terrific "Collector's Edition" series, so we can count on a decent number of solid supplemental features. First up is a running audio commentary from director Peter Hyams. This track tends to seem pretty dry much of the time - especially since Hyams clearly needed a while to warm up - and it includes a lot more blank spots than I'd like, but I still found it worth a listen. Hyams offers virtually no information that criticizes his cast and crew, but he knocks himself in a self-deprecating way and he gives us a lot of interesting information about the filmmaking process; there's a fair amount of stuff I'd never heard addressed in other tracks, such as details about the restrictions put on the use of babies. It's not a great commentary, but it's good. Next up is a promotional featurette called Spotlight On Location. This is a series of programs that Universal have created for their recent films, and they don't sufficiently replace the older documentaries the studio produced for releases like Field of Dreams and The Thing; I wish Universal would put that level of effort into the programs that accompany their newer titles. Despite that, "Spotlight On Location" is actually pretty decent; like other "SOL" productions, it may be largely promotional but it's more compelling than most other studios' featurettes. The piece for EOD is longer than most of those as well, at 25 minutes. Too much of the documentary seemed excessively self-aggrandizing; this is one of those pieces that shows everyone praise everyone else. However, I did really like some shots of an effects explosion and other on-set material, which helped make up for the rest. Much more effects footage appears in Special Effects: The Devil's Playground. This area offers nine different sections that address various effects issues and it runs for about 40 minutes total. The material can be a bit dry, since it's so heavily involved in the creation and execution of technical aspects of the film, but it's still quite interesting, especially due to the fact that we learn about a lot of different forms of effects. Each section is worth a look, and the structure makes it easy to check out different areas without having to sit through the rest. Book Of Revelation provides a very nice text history of that part of the Bible. I liked this aspect of the DVD because it provided information I didn't know well, and it helped give the film a stronger historical grounding. Soundtrack Presentation provides an ad for the soundtrack album plus videos from Rob Zombie ("Superbeast") and Everlast ("So Long"). In total, this segment runs for about nine and a half minutes. Both of the videos offer nothing more than the usual lip-synch/film clip combinations, thought Zombie's is at least a little more exciting and kinetic; the Everlast piece seemed exceedingly drab and dull. A few old stand-bys can be found here as well. The theatrical trailer for EOD appears, as does a preview for current release U-571, which can be found in the "Universal Showcase". Text information appears in the "Cast and Filmmakers" section, which provides mediocre biographies of five actors and Hyams, and in the pretty good Production Notes; the latter are duplicated in the DVD's booklet. Finally, some DVD-ROM features round out the package. According to the DVD itself, the DVD-ROM features "include additional materials about the movie, sound clips from the film, behind the scenes interviews and other information." Still no DVD-ROM drive for me equals still no comments about them, but at least you know they're there! End Of Days had some potential to create an exciting, pre-apocalyptic cash-in on millennial fever, but it manages to only provide intermittent thrills tempered by a pretty dull and predictable plot. The DVD itself is a winner, as it offers very solid picture, sound and extras. The high quality of the presentation and the mildly interesting nature of the film makes it worth a rental, I suppose, but I doubt it'll provide any form of long-term appeal.